For fifteen years I have showered in this shower stall and hated it. I could never get the shower tray clean and mildew built up in here like crazy. While I had the contractor who repaired my other bathroom still on speed dial, I played around with the idea of having the shower room in the master bath remodeled. I did not think I had any issues, like a leak, at the time. While the main bathroom was being repaired, I noticed that the tiles sitting on the shower tray in the master bath were a little loose. I decided one day to place some caulk around the tiles to temporarily patch it until I decided what to do. When I started to to this, I was curious as to why all of these tiles were suddenly so loose. So I pulled out a couple. OMG the board that was behind the tiles had disintegrated and water had been seeping behind the tiles .....for how long??? I immediately stopped using this shower. Fortunately, none of this water had damaged the laundry room ceiling below. I asked the contractor to give me an estimate on tearing the room up and replacing the shower and flooring. I told him that I would do the final work on the room regarding the ceiling fixtures and room walls which helped bring down some of the cost. I could not do the demolition on this room because my hands had gotten worse. Doctor's orders. Stop working with my hands! The other problem with this shower, besides the obvious, was the shower knob. I had wanted to change it, but it was welded (sweated) in. It would not quite turn off. You had to keep turning it left or right to find the sweet spot that turned it off. I had a plumber come in eventually that fixed the leak but I wanted to get rid of the outdated knob. I pulled out the in-wall soap dish after I stopped using the shower. The other big problem was the toilet. For years we could not flush solid waste. If you tried, it backed up. If it was used for liquid waste, very little paper could be used. Like no more than 6-10 squares of toilet paper. And even then, every 5-6 flushes, you would have to use a plunger. Two different plumbers on two different occasions worked on this toilet. 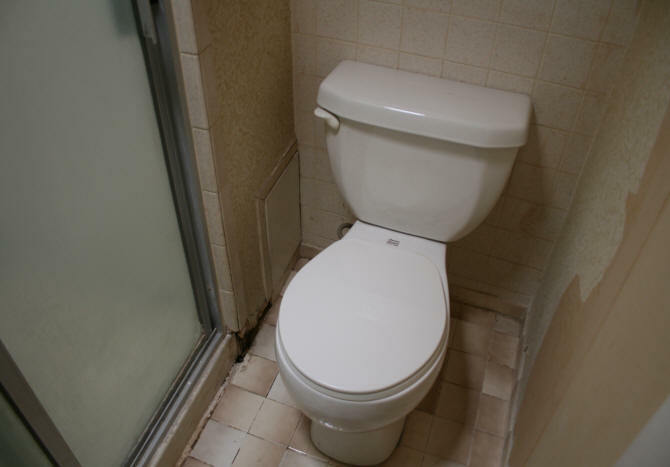 The toilet itself is only about six years old in the photo below. The toilet still was a problem. Water had also damaged the lower corner of the drywall. We suspected that there might have been some water leaking in below. The other thing I hated was the 4 inch tile on the floor. It was like ice when wet. 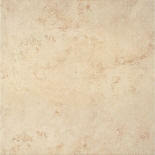 We suspect that this tile was added by the previous owner because it did not match the style in the rest of the house. There was also this horrible brocade wallpaper that had started to peel badly. The picture above shows the wall after I started pealing the paper. The other odd feature in this bathroom was the little door that accesses the valves for the shower. To do this though, you must be rail thin to fit beside the toilet and a contortionist. In looking at this floor on the right side of the shower tray, where the missing bullnose tile was, it appears as if the floor is slanted down. So we again suspected that there might be some water damage to the sub-floor. We would not know until the flooring was removed. 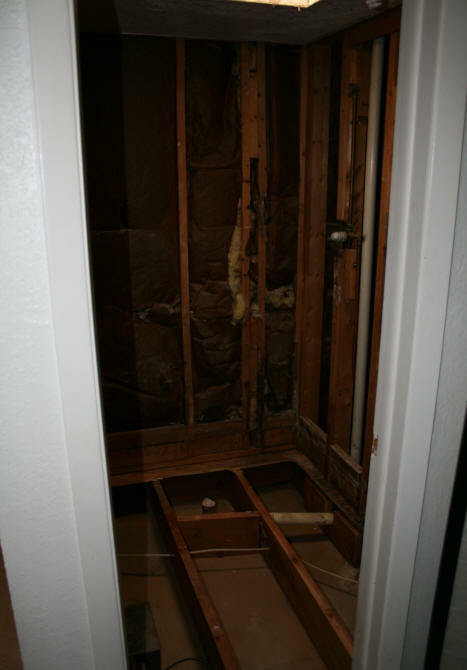 The plan was to remove the shower wall, the sub floor, and the drywall behind the toilet with the tile wainscot. 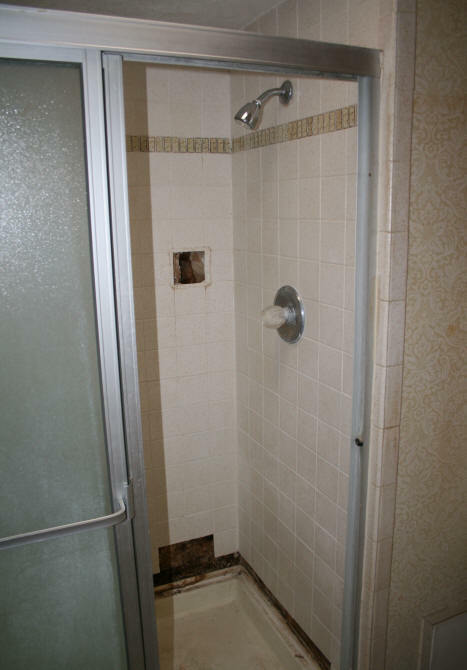 Damaged drywall on the walls around shower would be patched and remaining wall kept up because it was not damaged. The ceiling would be scraped and retextured. A new shower stall would be built. I then needed to start shopping for a new shower tray, shower door, shower faucet, and tile for the shower stall and floor. I needed to find all of these before the contractor needed it. Since I had to wait about a month before they would start on this bathroom, I had a little time. The first item I needed to research was the shower tray (also called shower pan, shower floor, shower base, etc). After the demolition, this would be the first item installed. I learned more about shower trays during this time than I ever wanted to know. I wanted to go with a tray as opposed to a tile floor. 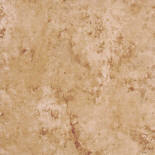 Also the shower tray option was less expensive and easier than creating a tile floor. I also like the pebbled flooring on the trays for safety reasons. The problem was finding the right type of shower tray. While I was on a strict budget, I do not usually buy the cheapest thing out there. I do want a quality product that will last a while. 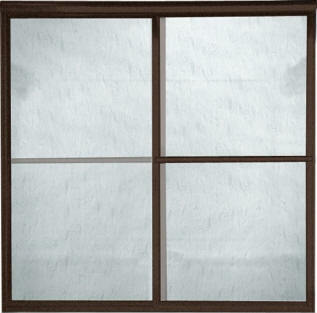 There are many different shower trays available in a variety of materials, sizes, and colors. I needed a single threshold tray that measured 32" x 48" and I decided on white because it would match anything and I had not selected the tile yet. This space was also so small and not very well lit. White would make the space brighter. 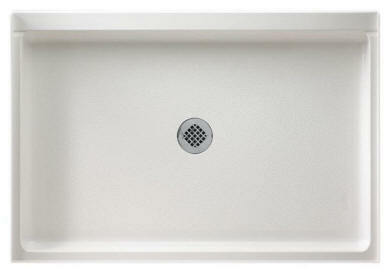 The tray that I settled on, based on the numerous web pages I read, was a solid surface tray. Meaning there was no coating on it to chip or crack. The brand I decided to go with was Swanstone. They have two types of shower trays. The solid surface SF03248MD.010 and the cheaper Veritek version FF03248MD.010 . I went with the more expensive solid surface. The price of the solid surface was about $100 more, but worth it. It is really tricky buying this online because the model numbers are so close. In fact, on the big box store websites you don't even see the word Veritek. The item they usually have available in-store is the Veritek model. I ended up special ordering the item in person at Lowe's because they had the best price and I could made sure I was getting the solid surface model, not the Veritek. I opted to pick-up the item in-store when it arrived. I was pleased with this tray. It was solid. Not flimsy at all. The plumbers loved the integral drain that came with it. The door was delivered by freight in a semi with the extra long trailer. The driver did phone to make sure the street I lived on was big enough with no low hanging electrical lines. I was good. The doors came in good shape except for one of the towel bars, it had a scrape on it and a frame piece that had a bend in it. These items were deep within the packaging so they were packed damaged at the factory. American Standard AM00.770422.224 Oil Rubbed Bronze Prestige 71 1/2" x 46-48"
I called Build.com and they did replace the damaged items promptly and with courtesy after getting the replacement parts from American Standard. So I was very pleased with their service. 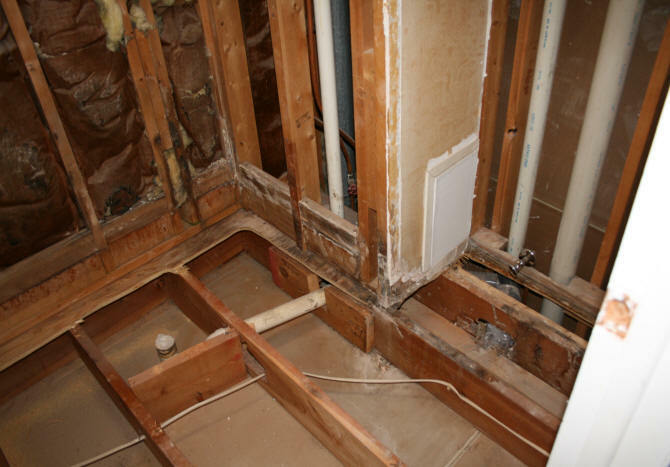 The demolition had not been done yet on the bathroom so the delay did not stall the project. The next item to purchase was the shower hardware. I wanted a combination shower head and handheld device. It also had to be available in an oil rubbed bronze finish. 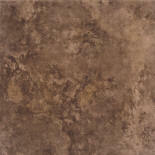 I decided on the Delta T17294-RB-I Linden Monitor 17 Series Shower with In2ltion in the Venetian Bronze. 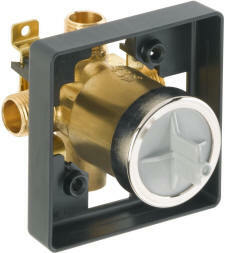 I purchased it on Amazon.com along with the Delta Universal Shower only valve that is needed for Delta's hardware. The last item I needed to buy was the tile for the shower stall and floor. For this I went to the Interceramic store here in El Paso. I wanted to be able to look at the tile colors in person. 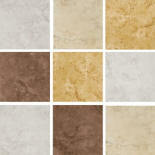 I decided on the style called Bruselas in the 6" x 6" tile. I went to the sales clerk and asked if all three colors were in stock. They did have all the items except for the Random Mosaic which had to be special ordered but would take less than a week to come in. I had my measurements with me so I found a corner in the store and drew out the design I wanted and how many tiles of each color would be needed. The 6" x 6" tiles had to be ordered by the case. The bullnose and random mosaic by pieces. The design I decided upon is above. This was the graphic I prepared for the tile layer. 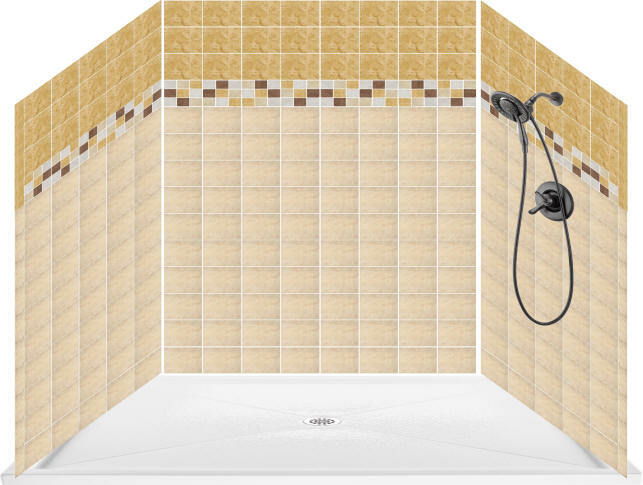 The shower would mostly be the bone colored tile with the random mosaic and gold tile at the top. I would be using the marron (brown) on the floor. The only thing left to buy was a grab bar and a tension pole shower caddy. In April 2013 the demolition began. The picture on the right shows the bathroom with all of the shower walls and sub floor removed. What damage did we discover underneath it all? Not a darn thing. All of the studs were in good shape. 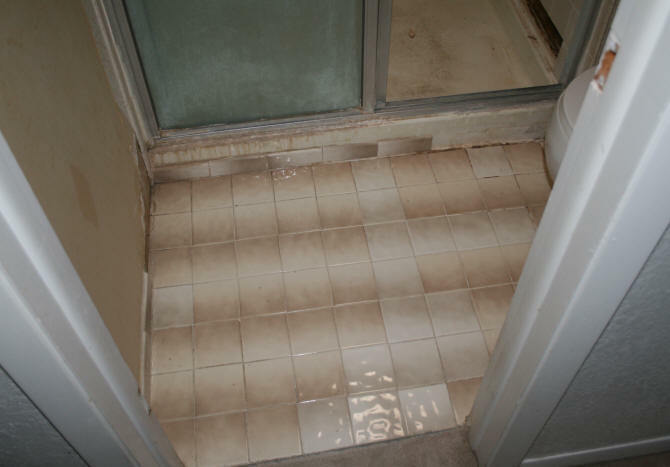 Other than a little water damage around were the tiles had given way, we were in good shape. 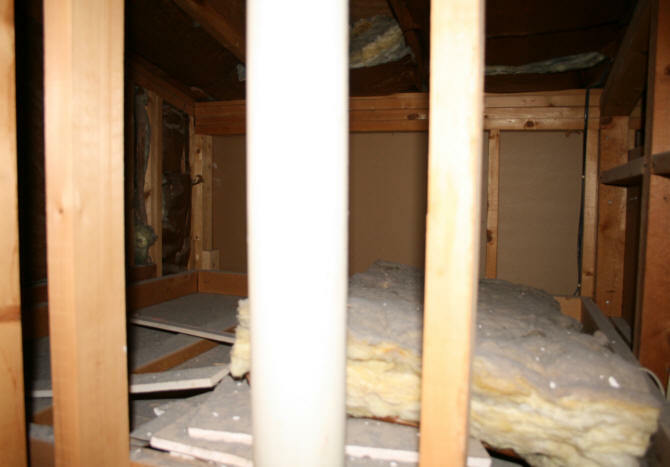 That black on the wall was not mold and the insulation was dry. One thing we did discover was why the toilet would not flush. Old lead pipes. The plumber explained to me why my toilet was not flushing. He told me that older lead pipes get soft over time. They start to cause a vacuum when they expand and contract which keeps a toilet from flushing properly. While this was an unexpected additional expense, I asked them to p-l-e-a-s-e replace the lead pipe with the pvc so I could finally have a toilet that actually flushed. 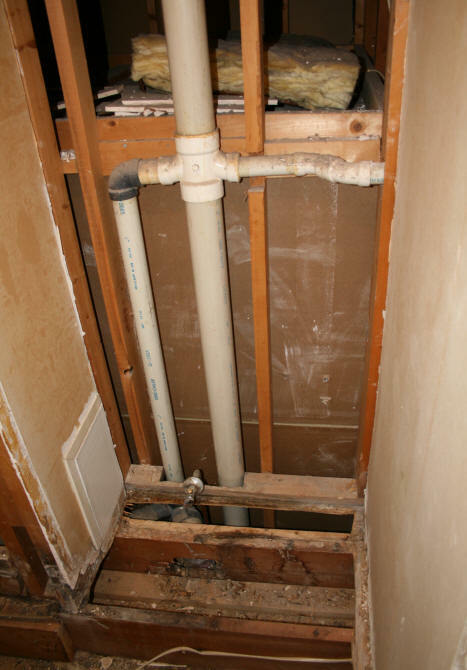 The photo on the left shows the wall that was removed behind the toilet. The curious thing we discovered was the wide open space behind this wall. As I mentioned on the home page, this house has a unique floor plan. What you are looking at here is the other side of the wall with the toilet in the main bathroom a half level down. The bottom of this open space is the ceiling of the main bathroom bathtub and toilet area. The far wall is the back of the walls in one of the bedrooms. What did it scream out to me, besides "stupidity", was "extra storage space". 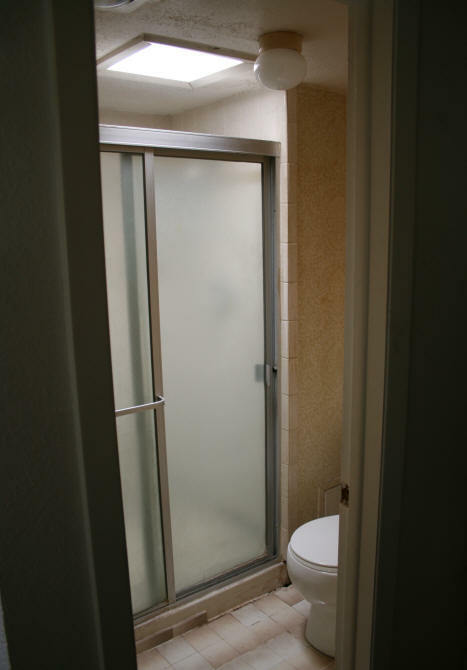 While not really accessible in this bathroom because of the pipes, it would be accessible from the main bathroom or the bedroom with a ladder. I also wondered why they did not make the 7' high ceiling in the main bath an 8' ceiling. I decided to convert this space into storage in the future. Close-up along corner of shower and toilet area.